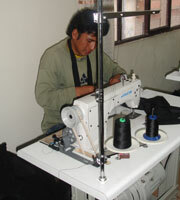 El Alto produces outdoor equipment which has been made in Bolivia. As well as the emphasis on quality design and workmanship, the focus of its product and branding has been to ensure that products are ethically sourced, staff fairly treated and a fair price paid. It has been formed as the partnership of Bolivian mountaineers, Bolivian tailors and Sussex based designers and outdoor enthusiasts. The name El Alto is the name of one of the poorest districts of South America, on the outskirts of Bolivia's capital, La Paz. This is where most of the local staff live. Its founder, Jonathan Cassidy, has been working and travelling in South America since the early 1990's, running expeditions, NGO and charity funded projects and, of course, enjoying the spectacular landscapes and cultures out there. There is obviously a great deal of need in many of Latin America's countries, but there is also a huge amount of talent and ability, and by encouraging this he felt that he could best help the less advantaged communities of the areas which have made him feel so welcome for so many years. It was this that inspired the formation of El Alto. Our factory in La Paz is wholly owned and run by Bolivians, from La Paz and El Alto. They are a combination of local businessmen and mountaineers who are delighted they now have a means to exist outside of the relatively short trekking and climbing season (May - September). The production staff are a small, very talented team which work perfectly together with our British designers to consistently make top quality products. We have endeavoured to make the working environment a fun one as well as a productive one, with all staff enjoying the chance to 'test' the gear out on the beautiful mountains surrounding the city at every opportunity. It is a family unit and we look forward to seeing it grow. Based in Brighton, our aim is to maintain the socially responsible ethos on both sides of the globe and to try to redress the work / life balance this country seems to have lost. We run a professional, slick outfit which puts its customers first at all times, we are happy to talk to or meet with customers interested in doing so. However, if you call us and you reach the answer phone, it is probably because the sun is out and so are we, but if you leave a message we'll get back to you straight away.